Recipe by Naiya Sheth: Earlier we made Handvo, A very delicious Gujarati farsan. That was a baked version and now it's time to make steamed handva muffins and that also with creamy cheese sauce. Yes, it may be said that this is a fusion recipe. A very delicious and quick spongy recipe. So let's make this homemade recipe of Steamed Handva Muffins with Creamy Cheese Sauce during this festive season. Heat water in a pan, meanwhile mix idli batter, yellow corn flour, semolina and handva flour in another big bowl. When water is hot add soda bicarb to it. Mix well to above flour mixture. Make the semi-liquid batter and put it in the warm place for 6 to 7 hours covered. Mix all ingredients excluding soda bicarb and oil to the fermented mixture and mix well. Sprinkle soda bicarb on it and then pour warm oil over it. Mix well. Place it in the silicon mould and steam in the hot steamer for 10 to 12 minutes. Remove when ready. Sprinkle red chilli powder to it. Heat oil in a pan and add mustard seeds to it. When they crackle add sesame seeds and asafoetida. Heat butter in a pan and roast refined flour to it. Add milk and mix well. Now time to add grated cheese. When cheese melts add pepper powder to it and mix well. In a serving plate arrange steamed muffins and then pour the tempering over it. At last pour creamy cheese sauce and garnish with tomato sauce and coriander. 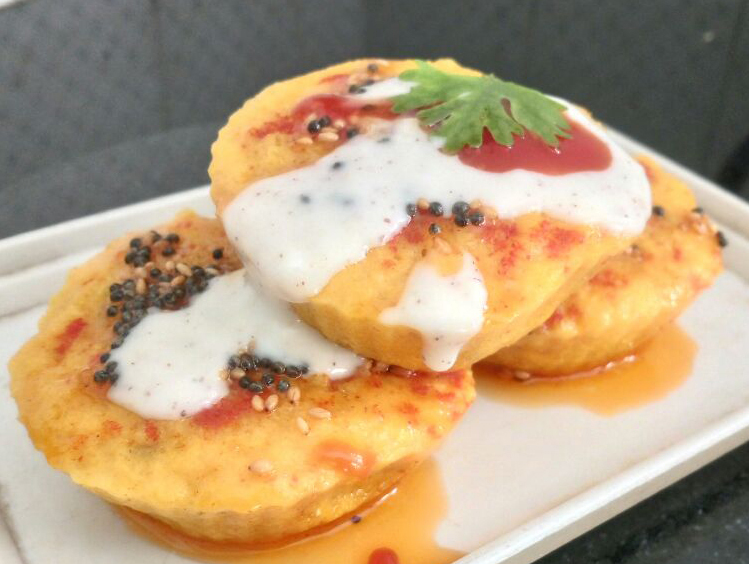 Super delicious Steamed Handva Muffins with Creamy Cheese Sauce is ready to serve. @ 2015 Naiya's Recipes | Simple Easy Cooking Recipes. Awesome Inc. theme. Powered by Blogger.